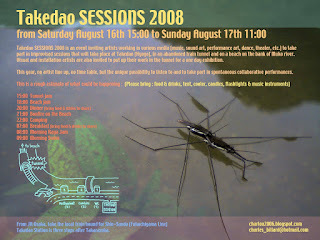 Takedao SESSIONS 2008 is an event inviting artists working in various media (music, sound art, performance art, dance, theater, etc.) to take part in improvised sessions that will take place at Takedao (Hyogo), in an abandoned train tunnel and on a beach on the bank of Muko river.Visual and installation artists are also invited to put up their work in the tunnel for a one day exhibition. This year, no artist line up, no time table, but the unique possibility to listen to and to take part in spontaneous collaborative performances. From JR Osaka, take the local train bound for Shin-Sanda (JR Fukuchiyama Line). To view a video sample of previous year's Takedao Tunnel Party, click on this.